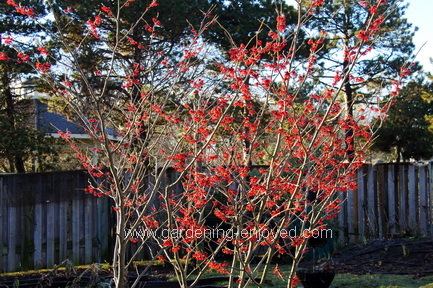 Dallying In The Dirt, Issue #285 - Diane the Witch Hazel is lighting up the back yard. If you are paying attention you might notice that certain seasons seem to bring recurring stories in “Dallying.” The first blooms of spring are one of those stories. Yes, I’ve already mentioned the snowdrops blooming but the really first bloom of spring is the Witch Hazel. It’s always in bloom long before the calendar’s first day of spring and this year is the earliest that it has ever bloomed. It was actually showing a fair bit of bloom in the last week of February. I have a very unsophisticated method of keeping track of its bloom date. I almost always take some pictures of it and by pulling up all of those pictures with my photo software, (ACDSee for anyone who cares,) I can look at the dates on the pictures. It’s also amazing to see how much it has grown over the years. The first pictures of a tiny branch, with a few blooms, sticking out of the snow is March of 2008. That makes this little tree nine years old this winter and it now is a little tree and not really a shrub. I have been pruning it each year to get that tree form and to make it clear of the path beside it. Yes, I probably should have planted it a little farther away from that path since I spend a lot of time telling people to allow room for a plant to reach maturity when deciding where to plant it. Taking one’s own advice is sometimes difficult. Anyway, Diane is magnificent this year. When I look out at the back yard and watch the snow disappearing I see such delights as the Witch Hazel but I also get to see some new chores for this spring. 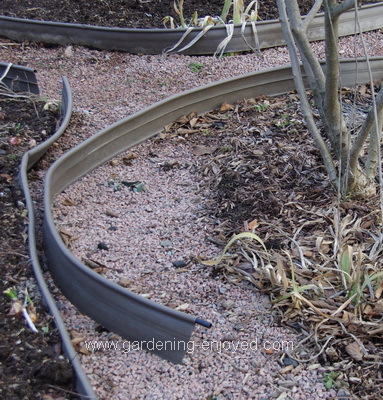 The constant freeze and thaw cycle of this past winter seems to have heaved a fair amount of my plastic edging out of the ground. Installing this edging has never been one of my favourite chores and now having to reinstall it is not making me excited about starting this springs activities. There always seems to be a list of such chores that are really hard to define as actual gardening. I realize that completing them will actually make the garden a better place to work and spend time in but wouldn’t we all rather spend time planting the new shrubs and flowers that signify forward progress. For all of my readers that live in Southern Ontario, it’s that time of year again. Canada Blooms, that huge wonderful show that celebrates all things gardening and lets us know that spring is coming, is opening on Friday. It’s always worth a visit. I am speaking there on Wednesday the 15th at 11:00 am. Come out and say hello and see what new vegetable gardening insights I will have to offer this year. There are many other things to hear and see at this don’t miss event. Carol Asks? Interested in hearing your comments on cold frames. considering a permanent one buried in the ground against the house on the south side and a portable one in the garden shed on top the growing bed for a longer growing period. Noticed that your’s are on top of the ground on your website. Going to make them out of exterior 1/2" plywood with 1 1/2" sheet insulation on the inside. Outside to be painted white and inside black. Your thoughts would be appreciated. Ken Answers! First, what appears to be a cold frame on my website is actually a hot frame. There is a heating cable buried in the sand on the floor. That greatly extends the season when I can use it. I have had a greenhouse and although they look nice and are pleasant to work in, they are very expensive to heat for a small amount of growing space. My 1.0 m X 2.4 m frame gives me as much growing space as many hobby greenhouses and I heat it for pennies with that cable. Mine has almost no space to be painted as the top and three sides are all of translucent corrugated polycarbonate sheeting. That’s standard greenhouse covering. If the sides are solid then the plants will stretch up to the light at the top.